Looking For The Best Electric Guitar For Small Hands? Here’s a look at our favorites, including our top pick the – ESP LTD EC-1000. Body Size – When looking for a guitar to suit smaller hands, consider the entire anatomy. Often, those with small hands have trouble handling a guitar with a regular body. The struggle to strum the strings causes the guitar to be held at an undesirable angle, in turn making it difficult to reach the neck to form chords. Opt for a guitar with a smaller body to eliminate that angle. Scale Length – Another option when choosing an electric guitar is to customize the neck. Those with shorter hands should pay attention to the scale length, which determines the length of the neck. Guitars with shorter scale lengths naturally have smaller necks. In addition to length, shape and thickness is also customizable. Depending on preference and anatomical ability, those with small hands could choose a thin or thick neck. Weight of Strings – Consulting a professional concerning the set up of a guitar is recommended for beginners with smaller hands. An advantage of a professional consultation is having your guitar set and tuned to precise standards. 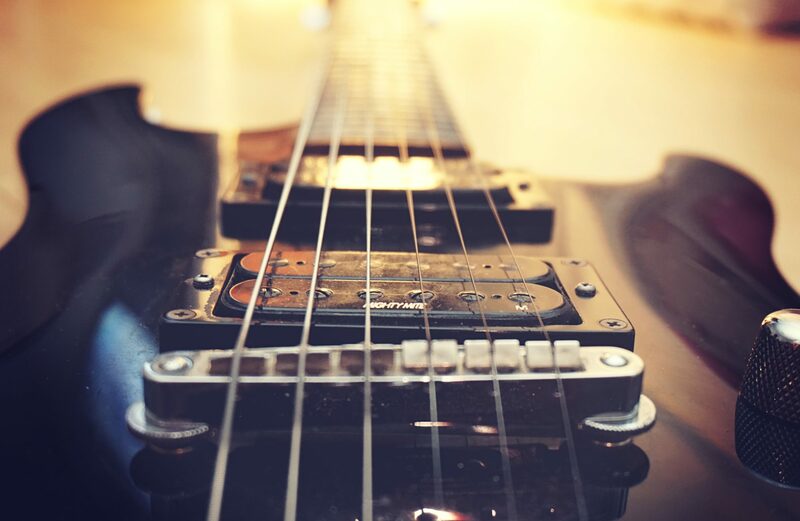 While the gauge of strings is usually dependent on the scale, a professional can install lighter strings in order to make the guitar easier to play with smaller hands. ESP’s LTD EC-1000 has a solid-wood body painted black with a rosewood fretboard and abalone inlays. It comes equipped with TonePros, a locking bridge mechanism that places screws on either side of both the bridge and stop tailpiece to maintain perfect tone and accurate tuning. Its neck boasts a 24.75 inch scale with large, easy to navigate frets and a thin neck. With EMG humbucker pickups and locking tuners, the guitar’s tone resonates beautifully. 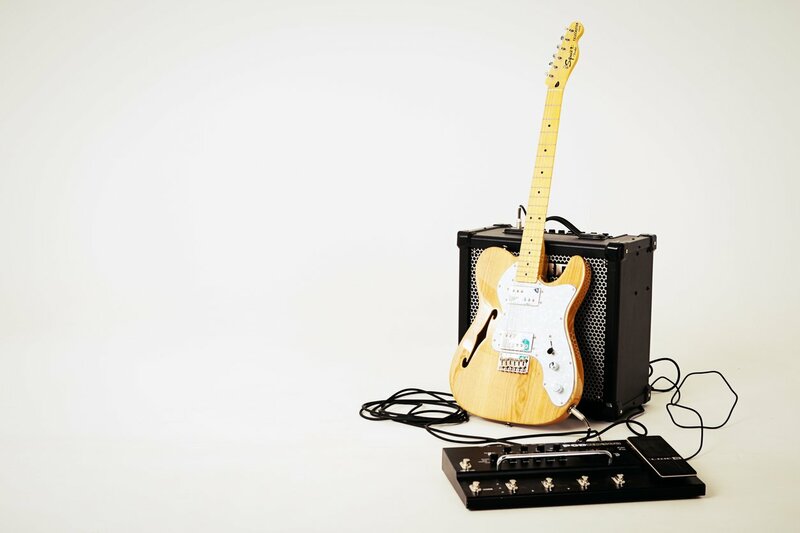 Those who purchased the EC-1000 from Amazon rave about its lightweight feel; the guitar weighs just 9.5 pounds. Reviewers also appreciated the guitar’s versatility. Although the ESP brand is typically associated with metal, reviewers found that the cleaner tones also allowed for the playing of classic rock and blues. Those with smaller hands will love the thin neck and easy access to higher frets that allow the guitar to be played with both speed and accuracy. With a body of mahogany, the Fender Modern Player Telecaster Thinline Deluxe is a lightweight and versatile guitar that offers a 9.5 inch, maple fretboard with 22 large frets that are easily manipulated by small hands. The Telecaster Thinline Deluxe also boasts a hard-tail bridge that allows the player to adjust the height of strings individually and gives the guitar precise tone. Those tones have range provided by the dual MP-90 single coil pickups. Amazon reviewers love the Epiphone Les Paul Standard, especially the clean tones that resonate from the double humbucker pickups. Its mahogany body is painted a sleek ebony, with a rosewood fretboard fronting the mahogany neck. The thin, 24.75 scale fretboard makes a person’s hand size a non-issue, and the locking Tune-o-matic stopbar makes it easy for the guitar to be tuned and stay in tune. The only complaints about the Les Paul Standard seem to revolve around the auxiliary output jack. One reviewer states that the hex nut that stabilizes the jack continually falls off, but is easily replaced. Another complains that the output jack tends to cut out often, but both reviewers rave about the quality of sound when the problem is easily fixed by reapplying the nut. ESP’s LTD M100FM has a beautiful basswood body coated in see thru black paint. The thin maple neck and rosewood fretboard make it easy for those with smaller hands to manipulate the strings. The M100FM is equipped with a Floyd Rose special bridge, which makes the process of tuning a bit different for those unfamiliar with it. To tune, allow a bit of slack in the strings around the headstock and tune slightly sharp. Lock the strings and use the screws at the Floyd Rose bridge to adjust the tuning. This bridge secures the strings firmly and allow the M100FM to stay in tune longer–something Amazon Reviewers raved about. 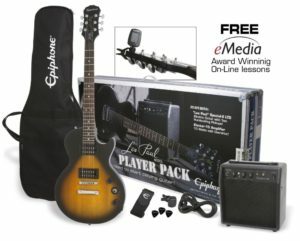 The Les Paul Player Package is ideal for novice players, as it not only includes the guitar, but an amp, a soft gig case, tuner, strap, picks, and downloadable guitar lessons. The solid wood body is painted a vintage sunburst, and it boasts a stop tail bridge and two humbucker pickups. As it is geared to beginners, the neck is more narrow than normal, making it an easy play for anyone with smaller hands and even those seasoned players experiencing arthritis. According to reviews, being manufactured as a beginning guitar does not downgrade the quality of sound produced. While playing guitar with smaller hands may present a challenge, all problems are easily remedied by finding a guitar that correctly suits the player’s anatomy. By using a smaller body, thinner neck with a shorter scale length, and lightweight strings, even those with the smallest hands have a chance to practice a hobby they love.